A black and white photograph of the 34th Regiment government armory building located at 105 Dundas Street East. 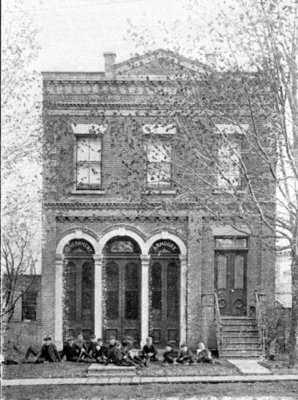 This building was built in 1878 on the south side of Dundas Street between Green Street and Brock Street. It was originally built as a marble works factory for Jonathon Wolfenden. This building was used as the government armory from c.1899 to 1946. Between 1946 and 1967 the building was used as a car dealership. It was demolished in 1969. The 34th Regiment was militia for Ontario County. They were known as the 34th Regiment from 1866 until 1920. After such time they became known as Ontario Regiment (RCAC). This group is sometimes also referred to as the 34th (Ontario) Battalion. 34th Regiment Armory Postcard, 1904, Keystone Press. Whitby Archives 29-001-003.